I have lived in a lot of places. Every year since I was 18, I have moved, often multiple times in a single year. Last year was a particularly mobile year, entailing three separate moves. I'm always concerned about the amount of stuff I have, and this is half the reason I love paper. It's light and portable, though a bit delicate. It's much less hassle to pack and move than my other hobby: replica chain-mail armor. Nigh on indestructible, but not particularly suited to a semi-nomadic existence. The other concern, of course, is how to make a new place feel less like a space I merely live with and more like one I live in. Having lived in a variety of places with a rotating cast of landlords, partners, housemates, flat-shares, friends and colleagues there are a few consistent patterns in what's permissible. Generally changing the wall color, wall paper, carpet, or flooring is not, though gratefully I have on occasion been able to make the longer lasting stays more pleasant with some paint. My present flat, however, is covered in cream chipboard wallpaper (this includes the ceiling). Living in London for most people means there isn't much spare cash around. So I started trying to find new ways to make my flat mine while maintaining a landlord acceptable level of alteration. I started with paper and color and some spray adhesive. I drew out a basic picture in Inkscape of what I wanted. I was looking to add life to my walls, and so I was reminded of the fields that used to grow behind the house I grew up in. Those were feed corn fields before they became suburban housing, and while not very picturesque, wheat certainly is. I created a design with rounded edges. This project is diamonds, but you could do squares instead. I had the advantage of a die cutter for this project, but one isn't necessary. The orange leaves are the same size but with a varied stem length, and the yellow are 25% larger. I created a repeating template for A4 sized paper. I cut the leaves out twice (once in orange and once in yellow) and the stems once. This meant that I had 5 big sheaves with 4 spare leaves and 20 smaller sheaves. I sat down and put adhesive on the back of each leaf and stuck it to my wall. A gentle swipe of the wall with a microfiber cloth or damp paper towel meant everything adhered much better. I used a spray adhesive which after months and months has not damaged the walls or discolored them, but this could be done as easily with little squares of double-stick tape. It rarely comes off of its own accord, and the one piece that did, I just slapped back on the wall. There is no need for perfection. The pieces are not as nicely laid out as in my drawing, but they have a much more organic feel to them—as if they might be bending in an Illinois prairie wind. You'll get 22 large sheaves and 31 regular sheaves from the templates, presuming you use 6 pieces per sheaf as I've originally designed them. You will be left with 4 spare sheaf parts for both large and regular if you make a mistake. There will be plenty of stems in all sizes with enough spare in the one sheet you purchased to make more if necessary. This project will take at maximum a few hours, but can easily be stopped and started again. It can be done in monochrome or this two tone compliment. It's exceptionally flexible. 5 sheets of colored paper. 2 each of complimentary colors for the sheaves and 1 in green for the stems. Your amount will vary based upon how many you're making. Each sheet cost me .35p (.55¢) at my art shop. Light Masking tape or scotch tape. A cut up garbage bag and a large piece of cardboard. Something you don't mind having adhesive on. Please note: You could opt to use double stick tape rather than adhesive, but might find the process of putting the tape on the pieces after they are cut tedious. The stems will be more difficult while the sheaf pieces are large enough to handle just a square of tape. 1. Print the templates. I've provided them here in A4 & Letter sizes depending upon where you live. When you print them don't scale them. You'll need as many templates as you have sheets of paper for the leaves. 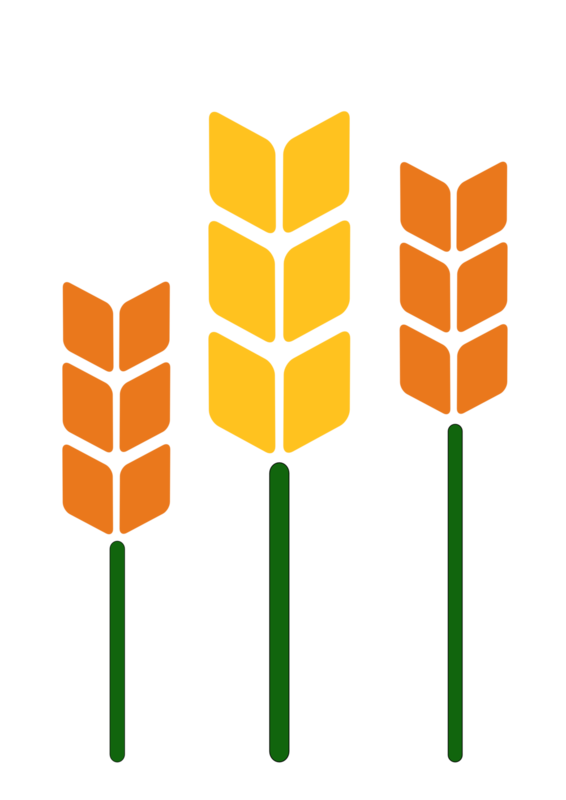 Sheaves Regular (A4) & Sheaves Large (A4) & Stems (A4) OR Sheaves Regular (Letter) & Sheaves Large (Letter) & Stems (Letter). 2. Match the template and the colored paper. Try to align them as closely as possible. Tape them down on all the sides to a self-healing cutting mat. This is a forgiving project, so if your leaves are a bit larger or smaller it doesn't matter. Nature is rarely perfect. 3. Cut the angled lines. Place the ruler along one of the angled lines across the short width of the page. Press firmly and while holding, run the knife along the edge of the ruler cutting only just past the edge of the last line. Do not cut all the way through the paper's edge. Move to the next parallel line and do the same. Cut all parallel lines first. Try not to jostle the previous cuts. The taped sides will help keep them in place. If you feel like they're moving, put a heavy hardcover on the section you're not working in. 4. Carefully cut all the intersecting lines. Again press down with the ruler and cut only just past the edge of the line, not through the edge of the paper. Repeat until all the lines are cut. Gently remove the tape and the edges of the template and colored paper sheet. Separate out the paper template from the colored paper. If any pieces aren't fully cut through, gently use the knife to separate. 5. Repeat from step 2 with the subsequent sheets of paper. 6. Cut the stems. I have provided enough stems for 2 templates each of the leaves. Match the template to the green sheet of paper. Tape down gently so they do not move. Cut using a knife and ruler. Start by cutting the top and bottom of the L-shaped section, using the portrait layout of paper. Then, align the ruler along each bisecting line and cut with the knife. Repeat with the mostly square section above the L-shape. Remember that the thicker stems are for the large sheaves only and the thinner ones in two lengths are for the regular sheaves. Separate out into piles by length and width. 7. Arrange and apply adhesive. Take your piece of cardboard to a well ventilated area and lay out a piece of disposable plastic around the cardboard. Apply a thin layer of adhesive. Let it dry. This usually takes about 2 minutes. Bring the cardboard back to your table, and lay out your designs, in reverse, on it. You'll use the cardboard like a painter's palette. Any combination of pieces that appeal to you can be used. Once laid out you'll coat the pieces in adhesive. Back in your well ventilated area, gently spray the adhesive above the designs. Hold the can well away and just use short bursts to cover each design. Let the adhesive dry. You'll know it's sticky enough if you press your finger on it and it feels sufficiently tacky. Don't over do it, but if you find it later comes off, you can always apply a bit more adhesive. Now, remove the design piece by piece and place adhesive side against the wall. Repeat until all your sheaves are on the wall. If you are using double stick tape: Lay out your designs. Cut off tiny squares and affix to the back of each sheaf piece, take care that no tape is outside the paper. cut thin sections to place on the stems. Remember that the thicker stems are for the large sheaves only. Adhere to the wall. I suggest putting tape on the sheaves and stems one at a time so that you can see how it looks as you place it on the wall. Simply place on the wall and vary your design as necessary. A firm push and they should stay on for a very long time.